Tuesday’s release of the latest GDP figures shows an increase in economic growth, led by the mining sector. These figures are already two months old and the mining sector is in turmoil. PAUL BERKOWITZ takes a closer look. The StatsSA release of GDP figures for the second quarter of 2012 showed an increase in the growth rate of the economy. GDP growth in 2012 Q2 (quarter-on-quarter, seasonally adjusted and annualised) increased from 2.7% in Q1 to 3.2% in Q2. The higher growth rate was pretty much in line with the average view of analysts, although the most optimistic and pessimistic among those polled were fairly wide of the mark. It could be that the ever-more-familiar uncertainty in global markets makes it harder to forecast, or it could just be that quarter-on-quarter growth figures are more volatile than their year-on-year counterparts. 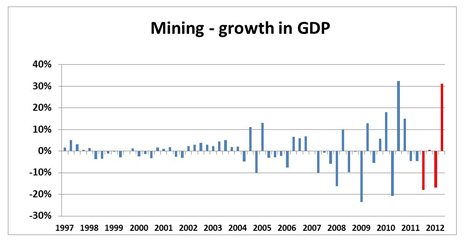 Since 2008 economic activity in the mining sector has become increasingly erratic. The period from Q1 2008 to 2012 Q2 spans 18 quarters. In 11 of those 18 quarters the sector has grown or contracted by at least 10%. For all of its ups and downs, the mining sector hasn’t really grown for a long time. In terms of its real rand it still sits at levels seen a decade ago. In 2002 the real value added was R100bn. 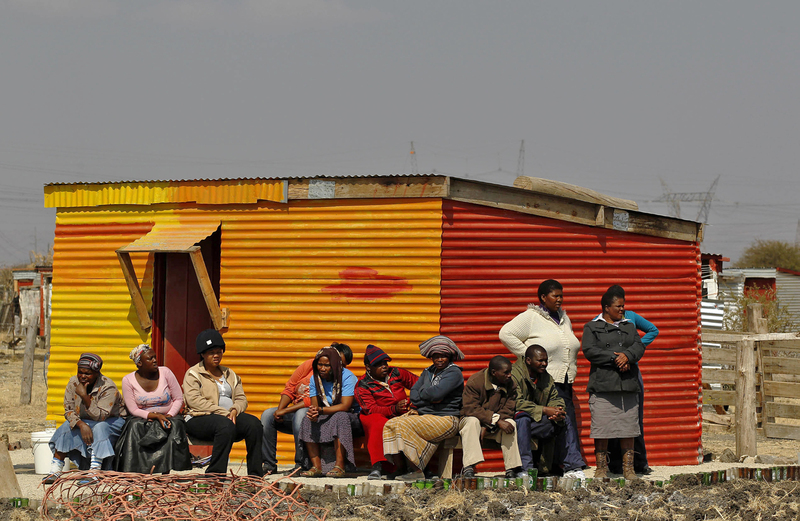 By the half-way mark this year mining had contributed R47bn to the South African economy. It would take a real optimist to predict that more value will be added in the second half of the year than in the first, particularly in light of recent events in the platinum-group metals (PGM) sector. At half-time, economic growth looks strong enough to meet the Treasury’s (downwardly revised) forecast of 2.7% growth for the calendar year. It is a game of two halves, as the clichéd tautology goes, and SA Inc is looking tired. Growth in agriculture is in the positive part of its cycle but the sector’s too small to get us there. Manufacturing output has started to contract again after the surprise growth spurt of last quarter. As we mentioned back then this growth didn’t look sustainable. Manufacturing is more likely to be an anchor than a sail, given the weakening demand from most of our export partners. Construction seems to be picking up steam and it may even return to sustainable growth rates above 5% if the public (and private-partnered) infrastructure builds get going. That’s unlikely to happen this year and the sector is also too small to shift overall growth too much. However, it is a labour-intensive sector and its success could make a welcome dent in the unemployment rate. Growth in the tertiary sector and its subsectors was uniformly lower compared to the first quarter of the year, which is another reason to worry. The tertiary sector is a good 70% of the economy. The slower growth reflects weak consumer demand and possibly a tighter fiscus as even growth in the government sector is down. The latest release has increased the expectations of the market that the Reserve Bank will cut interest rates again soon. That too might be a bit optimistic. The Bank is very aware of the growing food inflation risks and the chance of CPI rising higher and faster than its previous forecasts. The interest rate cut might come. It might also be reversed in double-quick time.